India and Japan have forged a special strategic and global partnership over the years, and Prime Ministers Narendra Modi and Shinzo Abe have developed a personal and special relationship, propelling the relationship between the two nations to greater heights. Last month, Abe invited Modi to his holiday villa in Tokyo’s neighbouring prefecture of Yamanashi overlooking Japan’s iconic Mt Fuji, before holding a formal summit in Tokyo. It was for the first time that Abe had invited a foreign leader to his holiday home, underscoring his close and trustworthy relationship with Modi, who had invited Abe to his home state of Gujarat when Abe was in India last year. Abe described Modi as one of his “most dependable and valuable friends” and called himself a “friend of India for life”. In what has become a ritual after each summit, the two prime ministers issued a joint “vision” statement, reviewing developments in the bilateral relationship and achievements since their last meeting, and laying out new plans for the future. Perhaps most significantly this time, the two leaders agreed to an upgraded 2+2 dialogue involving the defence and foreign ministers of the two nations, similar to the India-US process. Up to now, this meeting has been held at the junior ministerial levels, so the upgrade signified a commitment to Japan and India to a joint role in maintaining peace, stability and prosperity in the Indo-Pacific region where China flexes its military and economic muscle. Japan and India have already established several top-level defence and security dialogues including an annual defence ministerial dialogue and are engaged in the multilateral Malabar Exercise and bilateral Japan-India Maritime Exercise (JIMEX). They also welcomed an agreement for deeper cooperation between the Indian Navy and the Japan Maritime Self-Defense Force (JMSDF). On the economic front, Japan agreed to release the next tranche of overseas development assistance money for the high-speed train project to link Mumbai and Ahmedabad, the financial capital of India and a major trading centre. In a significant development, the existing bilateral currency swap agreement was raised to $75 billion from the previous $50 billion to give greater stability to the rupee, which has fallen rapidly in recent months. As a way to realise Modi’s “Act East” vision and Abe’s “Quality Infrastructure” and connectivity projects in Asia, the two reiterated a willingness to establish collaborative projects in the Indo-Pacific region, including in Sri Lanka, Myanmar and Bangladesh. This also extended to Africa, where China’s influence has grown in recent years. India is seeking to re-establish its historical bonds with Southeast Asian nations, and Modi and Abe also agreed that “ASEAN unity and centrality are at the heart of the Indo-Pacific concept, which is inclusive and open to all”. These are undoubtedly genuine and concrete strategic plans and both national leaders seriously want to realise them, but there are roadblocks. Some past declarations and agreements remain unfulfilled or underdeveloped. Implementation of political declarations and joint statements may be a hostage to politics in both countries. Despite a comprehensive economic partnership agreement more than five years ago, India-Japan trade still remains minuscule and has stagnated well below the $20 billion mark with the trade balance heavily in favour of Japan. Joint infrastructure projects have remained elusive despite their efforts to cooperate in Africa through an Asia-Africa Growth Corridor plan. It is still too early to know whether a willingness to undertake joint projects in India’s South Asian neighbours and elsewhere will be realised. In security and defence fields too, while Japan and India hold dialogues and meetings regularly, no military technology transfer or sale of defence equipment has yet taken place. The sale of the US2 amphibian aircraft has not materialised despite negotiations for many years now. On the question of Quad 2.0, India’s position has been ambivalent. Some analysts believe that India keeps on sending mixed signals and shows incoherence in its approach to military exercises with Japan and other Indo-Pacific partners, including Australia. Japan’s flagship quality infrastructure project of building the first high-speed train in India has also hit some obstructions in recent months, with farmers unwilling to sell their land and seeking court rulings on government acquisitions. 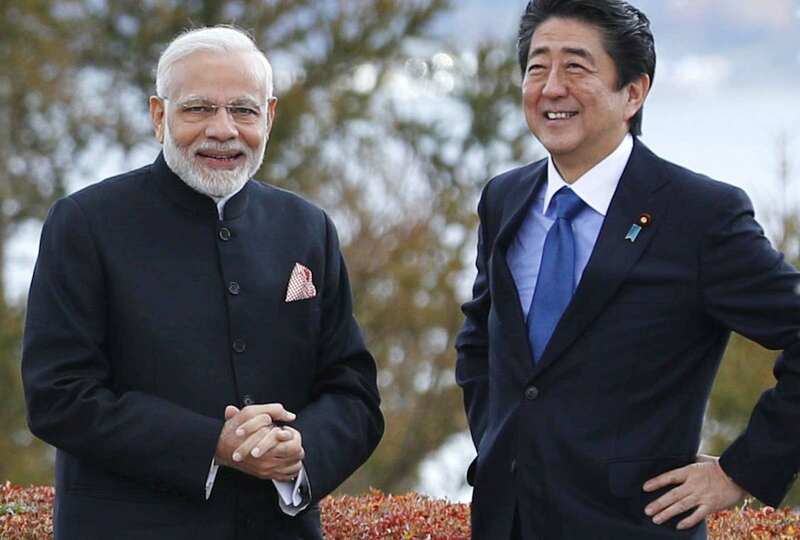 Both Modi and Abe will be busy from early 2019 with their respective electoral fights and may not be able to devote their full attention to the declarations and agreements they made at the 2018 summit meeting. If both Modi and Abe continue in their positions after the elections, India-Japan cooperation and implementation of plans should move forward with greater speed.